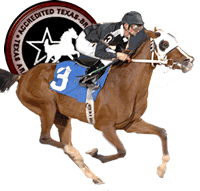 The Texas Arabian Breeders Association (TABA)'s annual race horse sale is set for Saturday, April 5 at Retama Park. The live auction will take place in Retama's saddling paddock, and the auction will begin at 1:00 p.m. Previews will be available Friday, April 4 and the morning of the sale. To request a catalog, call (972) 268-4930 or e-mail your request to auction@texasarabianbreeders.com. You do not have to be present to bid and buy. For more information on absentee bidding, contact TABA Auction Manager Jon Wales at (979) 268-4930 or e-mail auction@texasarabianbreeders.com. Additional details can be found on the TABA website at www.texasarabianbreeders.com.